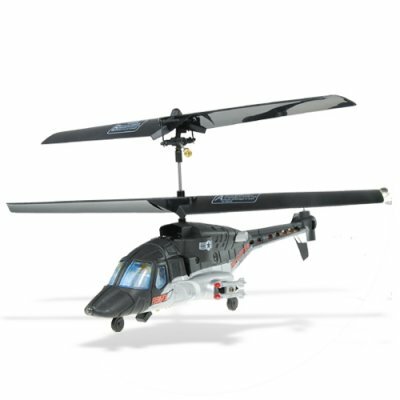 Successfully Added Realistic Attack Helicopter with IR Remote Control to your Shopping Cart. Realistic military attack helicopter with IR remote control. Take to the skies with this RC micro helicopter. This helicopter may be small, but its full-body design, authentic paint job, flashing lights and twin propellers will have your friends staring in awe as you buzz past their heads. The micro copter's even weight distribution and twin propellers help it fly a steady path as well as hover in place. With big, simple controls, flying this micro helicopter will come naturally to you whether you're a novice or an ace. With three channels of control, you can fly one helicopter while your wingmate flies another. The controller lets you change altitude, move forward, backward, left, right and hover in place. Chinavasion's unbeatable factory-direct prices let you get your wings on a budget. What keeps this helicopter from flying up without stopping? You do! The remote control lets you control the altitude at which the helicopter flies. Почти все классно за исключением одной проблемы в управлении. Вертолет всегда норовит вращаться влево или вправо при каких либо действиях (перемещение вперед, назад, вверх, вниз). При простом висении в воздухе вращение можно полностью прекратить с помощью спец ручки на пульте. Заряда батареи хватает минут на 10 непрерывной работы. LOOKS VERY NICE...MOST TOYS SHOULD BE MADE TO LAST 10 MIUTES...I AND PROBABLY ELSE WOULD TOO.GOOD TOY TO HAVE FOR SELF OR GIFT. IS,I HOPE I SELL SOME NEXT TIME THEY BACK ON THE WHOLESALER MARKET.